In the previous articles of the series, we covered web scraping and basics of text mining. We have also covered basic word cloud. Now it is time to learn some very useful text functions, web scraping variants. 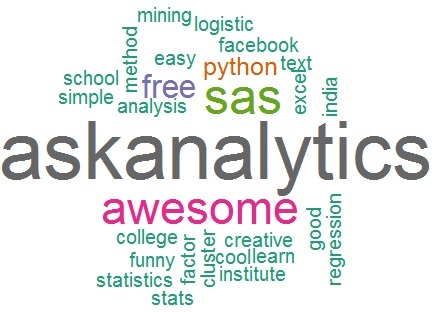 We will also learn "How to create comparison and commonality type of word cloud" and would learn to analyse the same. Q. Can we need to scrape tweets based on two hash tags occurring together? Q. Can we scrape tweets from specific users timeline, instead of hashtag basis? Ans. Well Yes. Example is within the article. Hash tag based scraping is done when we wants to know opinion of people about certain topic, timeline based scraping is done to know what a person/institution is up to. But we should learn both. # I have masked my credentials, you need to get your own ( If you don't know where you can get it from, I believe you have missed the first blog on the Text Mining series. # gsub is very useful function, do learn about it. We would write about it soon. 1. Document Term Matrix (DTM) : A document-term matrix matrix that describes the frequency of terms that occur in each and every document. 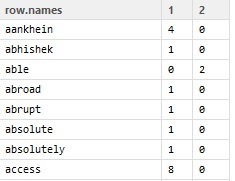 In a document-term matrix, rows correspond to documents in the collection and columns correspond to terms. 2. Term Document Matrix (TDM) : Similar to DTM but transpose of it . In a Term-Document matrix, rows correspond to terms in the collection and columns correspond to documents. 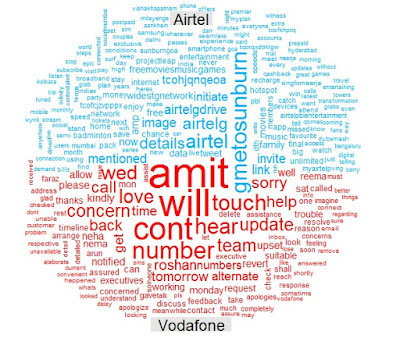 We can see Airtel twitter handle is mostly talking about its product, plans, features or events, Vodafone on the other hand is mainly replying to unsatisfied customers. Especially this guy Amit is writing most of their tweets. 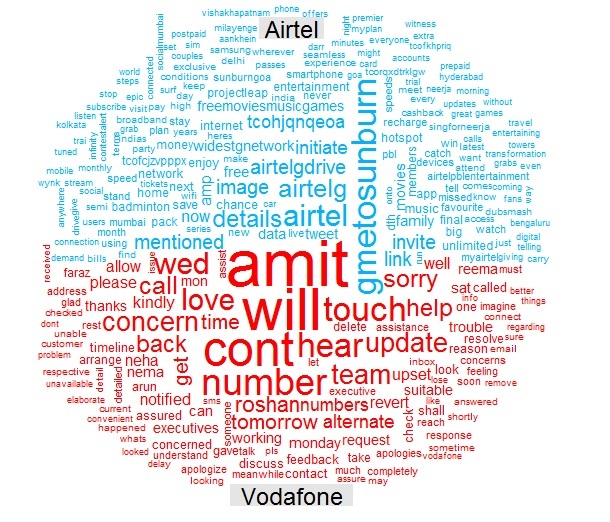 Thoughts that came to my mind : EITHER Airtel has got less complaints, while Vodafone has got too many of those, OR Vodafone is more focused towards customer satisfaction and hence it is using its Twitter handle to reply to customers complaints unlike Airtel, who is using it for advertising its products. 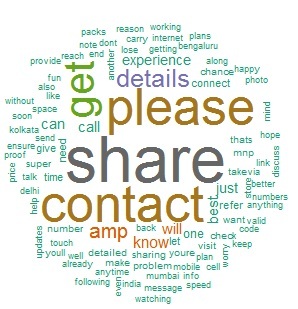 One thing is sure, If I take vodafone connection, I would need to talk to this Amit one day. Commanlity Cloud gives an idea about what common terms two (or more) entities are using. In this case, there is nothing much that can be interpreted.